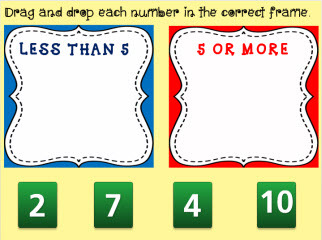 In this test, first grade students will compare numbers to 5. Young kids always seem to struggle when comparing different numbers to a given number. To help combat this issue, this fun online test allows students the opportunity to practice comparing numbers between 0 and 10 with number 5 by dragging and dropping each number in the correct frame. Return from this Compare to 5 Math Test to the Elementary Math Tests , 1st Grade Math Tests webpage, or to Math Tests.